The railway officials stated that the rush started since last five days as people started going to their native villages to cast their vote. 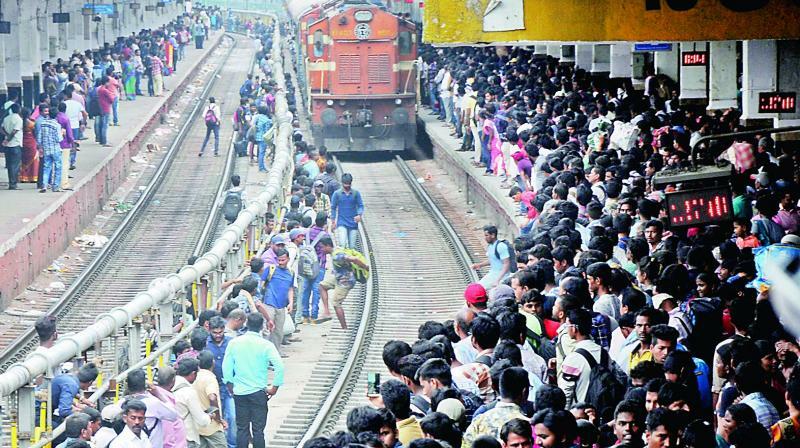 Hyderabad: Five special trains and 11 trains had additional coaches added apart from the 40 regular trains to clear the rush of people from Telangana State who are going to AP to vote on April 11. On April 8 and April 9, there were 15 special trains which were operating apart from the regular trains as a heavy rush of passengers was witnessed since the last three days at railway stations. Apart from trains, Andhra Pradesh State Road Transport Corporation has pressed extra buses into service and private operators also mopped up the major rush. The price of the tickets of private operators started from Rs 1,500 and peaked at Rs 4,500 per person on the last day of booking. Those affiliated to political parties and belonging to a particular constituency got party workers to arrange private buses where the cost of transportation and also the food expenses were covered. These special arrangements have been put in place by those parties who want to ensure that in the game of numbers there is nothing missed out. Similarly, the city also witnessed a lot of people working in odd jobs going back to their home town to vote in Telangana. The buses of Telangana State Road Transport Corporation have been going packed to the villages in Telangana since the last two days. There is also rush expected tomorrow morning for those who want to travel to Siddipet, Medak, Karimnagar and adjoining districts which are close to Hyderabad.